With easy access by road and air to the wilderness areas of the South Island, close to several beautiful forest parks, Hanmer Springs offers outstanding opportunities for freshwater fishing for both salmon and trout. All the keen fisherman needs is the right gear and a little determination. There are many outstanding fishing spots within the nearby Lake Sumner State Forest Park, Molesworth Station and the Waiau, Hurunui and Clarence and Rainbow rivers, to name just a few. Some are more difficult to access than others, but all offer splendid angling in an outstanding scenic setting. Fishing licences are essential, and available from the Adventure Centre. See our friendly staff to discuss options for helicopter flights to remote wilderness fishing spots. 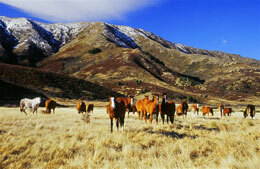 Trophy or Game hunters will find plenty of excitement within easy reach of Hanmer Springs. Department of Conservation block offer excellent hunting opportunities in the immediate area. 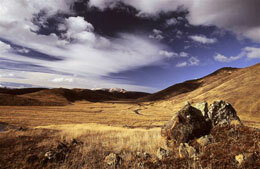 The slopes of the High Country have populations of wild pigs, red deer and chamois, as well as ducks and Canada geese. Helicopter charters are available for hunters on request. Please contact the Hanmer Springs Adventure Centre to talk about hunting options. Please Note: licenses are required for fishing and game bird hunting in New Zealand, and firearms users must be licensed. Hunters bringing guns from overseas must comply with Police and customs regulations. Anyone carrying firearms over Department of Conservation land will need a hunting permit from the Department – this will also give you information about the species you may hunt, and allowed hunting blocks. Pig hunters’ dogs are only allowed in certain areas. You can visit the DoC website to find out more about hunting in the Hanmer Springs area.